Today a very dangerous arctic blast is threatening much of the eastern parts of the United States. It is accompanied by record lows and bitterly cold wind chills. The reports of hazardous weather impacting our friends have prompted us to prepare a helpful list for those who may be forced to travel in these storms. What are the best steps to take to prepare to travel during severe winter storms? In this post, we will review in detail each of these important steps to preparing to venture out during a severe winter storm. Avoid travel if at all possible. The best way to stay safe during a winter storm is not to venture out in the first place. 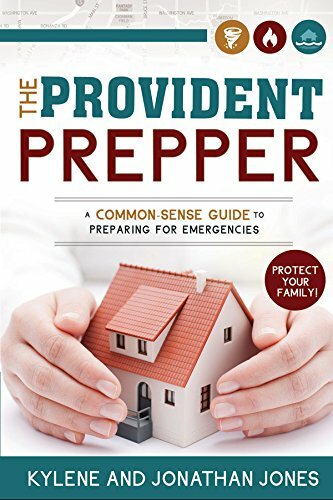 The best plan of action is to hunker down in the safety of your home. Prepare your home with the needed supplies so that you are not forced to risk your safety for a loaf of bread or a gallon of milk or Tylenol for the baby. Check that tires are in good condition and properly inflated, including the spare tire. Check all fluid levels and fill as needed. Check that windshield wipers, heater and lights are in working condition. If your battery is getting old, consider replacing it. Don’t wait for it to fail. Cold weather stresses car batteries and many batteries fail when temperatures drop. Never allow your fuel tank to drop below half. If you become stranded, a full tank will allow you to run your car for 10 minutes every hour or 5 minutes every half hour for an extended period of time to keep warm. Make sure the exhaust pipe can be safely vented and is not blocked by snow. A blocked exhaust pipe may result in carbon monoxide poisoning. Running out of fuel can be deadly. Planning ahead can make all the difference in being able to safely travel in a winter storm. Make the time to prepare before you leave to ensure that you will arrive back home safely. Stay on top of the latest road conditions and know the conditions before you go. Call 511 to get the latest traffic and road information. This will provide you with weather conditions, restrictions and road construction. The last thing you want to do is to get stuck behind a road closure in a deadly storm. The Emergency Alert System (EAS) and National Oceanic and Atmospheric Administration (NOAA) Weather Radio are both good sources for emergency alerts. Program your car radio to local stations that provide you with frequent weather updates. Travel during daylight whenever possible. In general, the dark brings colder temperatures and compounds the dangers during a storm. It is harder to see at night. Daylight brings more people who have the ability to see and help should the need arise. Travel with a companion or consider traveling with others in a caravan. Traveling together increases your ability to see dangers and provides quick help when needed. It is comforting to have someone else with you when the situation gets intense. Notify a friend or family member of your exact travel plans. Be sure to include your destination, primary and alternate routes, and timetable. If anything changes, notify them immediately. Periodic updates will ensure that if something happens, you can be located and rescued much sooner. Take a thermos (or two) of hot coffee, chocolate, tea or soup to warm you up from the inside out. It will make the journey more enjoyable as could be a life-saver should you get stranded. A good quality thermos can keep beverages hot for up to 24 hours. Charge your cell phone before you leave. Take a car charger and an extra battery bank so that you don’t get stranded with a dead battery. Communication is important. A two-way radio may also come in handy as a back-up. We separate our vehicle emergency kit into two unique kits. The personal emergency kit is intended to take care of the physical needs of the passengers in the car. The purpose of the vehicle kit is to ensure that the vehicle can remain in working condition. Visit 14 Emergency Kits to Help You Dominate Disaster for more ideas on building a great emergency vehicle kit. The personal emergency kit should contain everything that you need to stay warm and comfortable. It is a good idea to store this kit in a backpack in case you need to leave the vehicle and travel by foot. Pack enough for each passenger in the vehicle. You may decide that you need a separate one for each passenger depending on the circumstances. Blanket and/or sleeping bag for warmth. Warm coat, boots and rain gear to keep you warm and dry. Warm clothing in case you get wet or need to add a few more layers to keep warm. Gloves or mittens to keep your hands warm. Include a good pair of sturdy work gloves in case you need to change a tire, shovel snow, etc. Socks to help keep your feet warm and dry. Winter ski-type hat to keep your head warm and dry. Make sure that you include something to cover your ears. High energy, non-perishable snacks such as protein bars, granola bars, trail mix, etc. to give you energy. Canned foods with a pull-top may be a great idea. Pack utensils if needed. Bottled water to keep you hydrated and reduce the risk of hypothermia. Always take more than you think you will need for all of the passengers in the vehicle. Flashlight and extra batteries to make sure that you can see and be seen. Emergency glow sticks are also a valuable tool to help you be seen. Heat source to keep you from freezing. Some ideas worth considering are a heat and light candle, 115-hour emergency candle, matches, along with hand and foot warmers. Multi-tool knife to provide a variety of tools for survival. Personal sanitation items such as an emergency toilet and toilet paper. Plastic bags can be used in a pinch. Emergency stove for melting snow for drinking water or heating up food. Books, music, games or small toys may be helpful to pass the time. Whistle to help alert rescuers to your location. The vehicle kit will be heavy and we like to keep ours in a heavy duty tote in the back of the car. It should include items specifically for the needs of the vehicle. Jumper cables to start a dead battery. Sand or kitty litter for traction to help get you out of a tough spot. Shovel and/or snow shovel to dig your way out of snow. Tow rope or chain to pull you or someone else to safety. An emergency tool kit that contains screwdrivers, adjustable wrench, pliers, and razor knife. Emergency collapsible gas can in the event you run out of fuel and need to get more. Tire chains for times when they are required to travel on some roads. Fix-a-Flat may temporarily seal and inflate a flat tire enabling you to get to a safer location to fix it. Emergency flares to help you be seen by other vehicles. Being exposed to cold weather can put you at high risk for both hypothermia and frostbite. These are dangerous conditions that can be life-threatening, but both of which can usually be avoided with knowledge and planning. Hypothermia occurs when your body loses heat faster than it is able to produce it. In order to avoid hypothermia, you need to be proactive in providing enough warmth to maintain your body temperature. Stay hydrated and move around to keep up your circulation. See Surviving a Winter Power Outage – How to Stay Warm for more information on avoiding hypothermia. The areas of the body most susceptible to frostbite are uncovered skin and extremities (hands, feet, nose, ears, etc.). Your best protection from frostbite is to find shelter and get out of the cold. A vehicle can be a valuable shelter. Make sure that all parts of your body are covered. Parts of your body that are exposed are at greater risk for frostbite. Increase blood circulation through movement and avoid tight-fitting clothing that may inhibit blood flow. 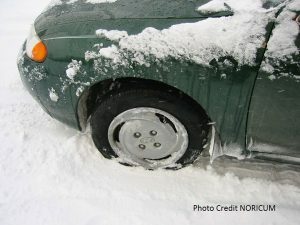 If you get stuck or stranded, stay in your car, turn on your flashers, call for help, and wait until help arrives. Another way to signal is to attach a brightly colored piece of cloth to your antennae. If it is not snowing, you may want to put up your hood to signal trouble. It may seem like a bit of overkill to spend time and resources preparing an emergency vehicle kit, but it may just save your life someday. I have a co-worker who commuted over a mountain pass to work each day. On his way home, he came across a group of men that were stranded by the side of the road. He stopped to help them but was assured that they had the situation under control. The next morning he learned that those men had frozen to death that night. Do not be overconfident in your ability to conquer Mother Nature. Winter storms can be deadly. It is more than just being inconveniently cold. Your best bet is to avoid going out during the storm. If you can’t avoid it, prepare for the worst and be grateful if you never need the supplies you packed.